Nobody tells me Thorin Oakenshield dies! What!...come on...! What wrong with you people?! Well, that's a huge spoiler. That's why we didn't tell you. . . . And it's just so sad!!!!!! The use of any kind of offensive, discriminatory, or otherwise inappropriate material deemed unsafe for younger members will result in the post being deleted. ...I don’t think I’ll post them. @Jacoby_Elderfun1 When our older brothers watched it, mom forced me and Scarlett into our room... all we heard was screams and action sounds coming from the TV and we were like "WHYYYYYYY!!!!!" Have you never read the books or watched the films before, @May_Otterview? Attention @everyone: don’t tell @May_Otterview or @Emily_Purplebottle any spoilers about LOTR! So true. 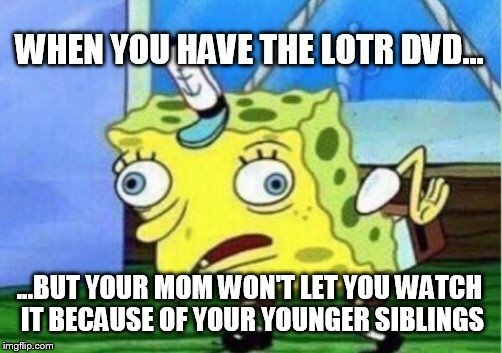 If my mom didn't hold to that principle I'd watch LOTR every Saturday morning with @Shelara_Purplematch instead of the regular cartoons. Emmalee has not yet gotten over Fili and Kili. My nephew is named Strider. I call him 'my little Ranger nephew'. He likes me. That's... awesome... If I ever have twins, man... Kili and Fili... HERE WE GO! !